Oregon had a variable harvest with some areas forced to bring in the crop before the grapes were ripe. The vintage is being referred to as a “winemaker vintage,” as the skills of vintners will be challenged to deal in some cases with grapes with low to moderate sugars and tannins. 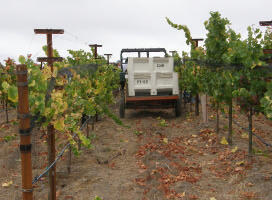 In California, harvest started early in most regions and crop yields for Pinot Noir were reportedly down 20-50% compared to the generous harvest of 2006. Generally, cluster weights were light but quality was very good. I asked a number of winemakers and winegrowers throughout California and in the Willamette Valley of Oregon to comment on their harvest. Overall, they were bursting with optimism. God bless ’em, winegrowers always look for the positive. Patrick Mahaney, Director of Vineyard Marketing for Premier Pacific Vineyards, told me that the Willamette Valley had “a fantastic growing season, although the winter and spring rainfall was closer to normal.” The days were beautiful and sunny with very little precipitation during the growing season. A significant amount of fruit was harvested from the Gran Moraine Vineyard in the Yamhill- Carlton District before the October rains hit. The Roserock, Zena Crown and Willakia sites in the Eola- Amity Hills AVA were not quite mature when the rains hit, so harvesting took place during breaks in the storms. Fortunately, there were enough breaks so the vines continued maturing their fruit and “we were able to harvest ripe, dry Pinot Noir that should deliver some great wines.” Importantly, botrytis was not an issue. This was most likely due to a combination of good farming practices and the fact that the storms originated in the Gulf of Alaska and therefore brought cooler temperatures along with the precipitation. 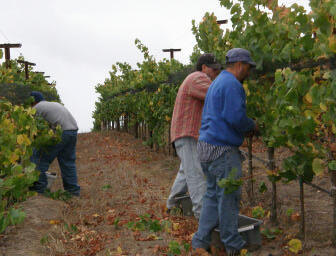 Larry Londer of Londer Vineyards reported that harvest ended mid October in the Anderson Valley. The summer started out cool, then got into the mid 90s during mid-September. Many people picked by the 3rd week of September. It then turned cold and rained a few times which precipitated another round of picking. The weather became nice again during the first week of October and most picked during this week. “My last pick was on October 9th and it started raining that afternoon (heavy) which lasted for nine straight days.” In general, yields for Pinot Noir in Mendocino County were down 15- 20% from last year. Lucky for him, he predicted a light year and left an extra bud when he pruned. His yields were almost the same as last year as a result. As usual, harvest was not without challenges in this cool growing region of California. Barbara Drady of Sonoma Coast Vineyards notes that “quality is outstanding, but quantities are off substantially - some vineyards as much as 40%. Cluster count was fine but cluster size/weight was way off.” The only vineyard Barbara harvested that brought in more than expected was Balistreri which came in at just under a ton per acre. “The clusters are teeny - about 3 inches long!” As of October 23, she still had about 12 tons of Chardonnay on the vines. It was only 21 Brix before the rains hit. Some botrytis will occur for sure, but with the low sugars, it could make for a very special wine. Jonathan Pey of Scenic Root Winegrowers (Pey-Marin, Mt. Tamalpais, Textbook & Spicerack Vineyards) reported very small yields. 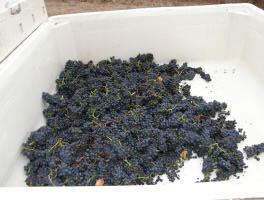 Pinot Noir was brought in from the Pey-Marin block of Corda Vineyard on October 3, but the yield was less than ½ ton per acre. This was partially due to poor fruit set. Some bird damage occurred for the first time in eight years so he will be netting his block next year. Quality looks very good. He also obtained some Pinot Noir from Stewart Johnson’s Kendric Vineyard in mid-September which is very, very good. Across Marin, the rains were a non-issue and everything was picked before they showed up. Gideon Bienstock, proprietor and winemaker of Clos Saron, said “it was a growing season from hell.” It started out with the earliest bud break ever, followed by nearly three weeks of nightly frosts in April, continued with two severe hail storms in May, and ended with high humidity in August.” The result was mildew in some locations. He lost over a third of his crop, including 100% of the Texas Hill Road Vineyard he farms nearby and 50% of his Home Vineyard Pinot Noir. On top of the quantity losses, the quality was uneven. He does not know how others fared in the region, but frosts were widespread in the foothills. Chris Hammell, Vineyard Manager at Bien Nacido Vineyards, complained, like most growers, about the weather. A cold, dry winter and was followed by a cool, windy spring. This caused vine stunting, low vigor and erratic fruit set. The summer, however, was beautiful. Mild nights, consistent low-tomid seventies daytime highs and gentle afternoon breezes were the norm. Heading into veraison, the vines were healthy and well-balanced. Harvest began the second week of September and the vintage could turn out to be outstanding. Deborah Hall of Gypsy Canyon Winery reported that 2007 was a light harvest for everyone. No one had any Pinot Noir for sale. The fruit is stellar, however, a smaller than expected crop with intensely flavored berries, really beautiful fruit. Deborah’s Mission grapes were still on the vine as of October 23, with harvest still three weeks away. Some reports indicate yields in Santa Barbara County in general are down 30%. Dan Baumhefner had some interesting comments on the trend in grape harvests in California. He remembers when every year was a vintage year in California. That ended in 1974, when the first of that decade’s drought years was recorded. He notes that every year since then has been weird for one reason or another. After the drought years ended in the late seventies, the first El Nino floods arrived in the early eighties. “Since then, we seem to always havestrange weather, with the effects all over the spectrum from severe flooding to seemingly endless drought every year. Each year is totally different than the last. The effects change, but the cause remains the same.” Don’s nominee for the cause of all this is global warming. Prior to 1974, every year was very similar to every other year in California. Every New Years Day was sunny and warm in Pasadena. The harvest in the Russian River Valley always began on September 1 for sparkling wine grapes, September 15 for early ripening Chardonnay and Pinot Noir for table wine, and finished on Halloween with the last of the late ripening Cabernet Sauvignon and Zinfandel. All of the winemakers then took their kids out for trick or treat and life was good. Now we start harvesting in July and Chardonnay is a late ripening variety, being picked in October! The Finger Lakes region is a challenging area for successfully growing vitis vinifera. 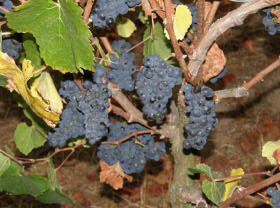 The winters are cold, vine diseases are always a threat and ripening is often an issue. The Cornell Daily Sun (October 23, 2007) reports that the answer might lie in newer hybrid grape varieties. Professor Bruce Reisch, of the Department of Horticultural Sciences at Cornell University, has been doing research on new disease- resistant hybrid varieties that can withstand the frost of upstate New York and still develop the types of flavors so desirable in table wine. Testing of hybrid grapes can take as much as 20 years. Each year Reisch plants about 5,000 seedlings, looking for that one new selection which displays promise. The new hybrids are more resistant to disease and provide important environmental benefits because of the need for less pesticides and fungicides. 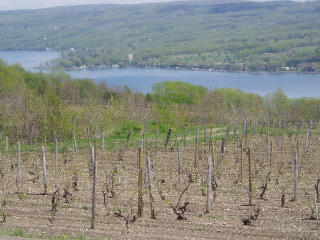 The Finger Lakes region has 80 wineries now, up from 45 in the late 1990s. Many of the wineries have turned to the new hybrids which offer interesting flavor profiles in their own right. Corot Noir makes a light red wine with cherry and raspberry flavors. Melody has notes of lemon and peach and is close to Reisling in taste. Other hybrids being grown include Valvin Muscat, Cayuga White, Noiret, and Traminette. Cayuga White, developed in 1972 as the first Cornell hybrid, now accounts for between $10 and $15 million dollars of wine production each vintage. Michael Bonaccorsi was a talented sommelier who distinguished himself at Masa’s Restaurant in San Francisco and later for almost ten years at the original Spago Restaurant in Los Angeles. His passion for wine led him to become the twentieth Master Sommelier in the United States. He had a knack for matching wine and food and making diners comfortable through his unpretentious approach to wine. He met Jenne Lee, a native of Seoul, Korea, while she was working at Spago and the two married. Fittingly, they were married in Burgundy. In 1999, they formed the Bonaccorsi Wine Company, sourcing grapes from premium vineyards in Santa Barbara County and San Luis Obispo County. From their first vintage, the wines were well received by the wine press and sommelier community . Tragically, Michael passed away suddenly from a heart attack in 2004 at the age of 43. Undaunted, Jenne Lee has kept the Bonacorssi label going, making the wines with the assistance of winemaker Sashi Moorman (Stolpman). The winery is located in the Lompoc “Wine Ghetto.” In addition, as a lasting memorial to Michael, Jenne Lee has started the Michael Bonaccorsi Scholarship Fund for viticulture students at University of California Davis. An annual fundraiser is held in West Los Angeles each year (www.bonaccorsifoundation.com). I had the pleasure of sampling four recent releases from Bonacorssi Wine Company. In addition to the two 2004 wines tasted, there were a Cargasacchi Vineyard and Melville Vineyard bottling. In 2005, besides the Santa Rita Hills and Presidio Vineyard bottlings described here, there is a Sanford & Benedict Vineyard spring release and a Cargasacchi Vineyard, Fiddlestix Vineyard and Melville Vineyard Pinot Noir all of which will be available in November, 2007. The wines are aged 18 months in 50% new French oak. 15.1% alc., 400 cases, $55. Composed of fruit from Cargasacchi, Melville and Fiddlestix vineyards. Clones 115 and Pommard. · Lightest in color of the wines tasted. The nose is introverted even after two hours showing restrained notes of red fruit, hay and oak. There is a rich palate of primarily red cherry and red berry fruit with a hint of anise and a texture of milky softness. 15.1% alc., 150 cases, $60. · A demure aromatic profile of organic matter and dark crushed berries. The alcohol peaks out a tad on the nose as the wine warms in the glass but is not intrusive. Packed with sweet dark cherry and black raspberry fruit with an oak sidecar. Very satiny and sensual texture. The whole package is quite enjoyable and this is clearly my favorite. 14.3% alc., $60. · This deeply colored wine has a woodsy, damp, barnyard aromatic profile. The flavors are complex with black fruits, spice, earth, herbs, root beer, wood and raisin evident. The texture is caressing. Mild drying tannins are evident on the finish. 14.3% alc., $60. · Dark garnet in color. Forest floor and oak frame the darker Pinot fruits on the nose and on the deep palate. This is a wine with an earthy edge and is muscular but not harsh. The finish is lingering. Bonaccorsi Wine Company wines are sold on the website, www.bonawine.com, and through retail channels. The 2005 spring releases are sold out at the winery. The 2005 vintage wines are strikingly silky in texture and demonstrate a harmonious integration of oak. They will appeal to fans of biggerstyled, virile and opulent Pinot Noir. A large review of the medical literature on the health benefits of alcohol was published recently in the medical journal, Circulation (2007;116:1306-1317). The report was from the Heart Institute, Good Samaritan Hospital, and the Division of Cardiovascular Medicine, Keck School of Medicine, University of Southern California, Los Angeles and the Department of Cardiology, Marshfield Clinic, Marshfield, Wisconsin. The article is titled, “To Drink or Nor to Drink? That is the Question.” The authors are Robert A. Kloner, MD, PhD and Shereif H. Rezkalia, MD. As the authors point out, the scientific debate over the health risks and benefits of alcohol dates back several centuries starting in Europe and continuing to the present time. All of the studies to date are observational and epidemiological. There has been no long-term prospective, randomized trial in which one group abstains and a second group receives 1 drink of alcohol, perhaps as red wine, once a day or once every other day, and followed long term. 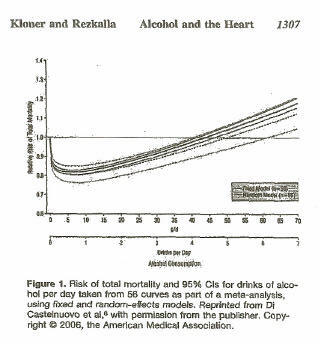 That said, there are many studies that have shown a J-shaped or U-shaped curve to describe the relationship between alcohol use and total mortality (see figure below). The optimal benefit of alcohol occurs at approximately a ½ a drink per day. Less than 4 drinks per day in men and fewer than 2 drinks per day in women appear to bestow benefit. Beyond these amounts, there is an increased mortality. In the United States, a standard alcoholic drink is a 12 oz of beer, 5 oz of wine, or 1.5 oz of 80 proof spirits or liquor. Some studies have shown an advantage of wine over other types of alcoholic beverages, but other research indicates that the type of drink is not important. The overwhelming majority of data indicates that moderate drinking benefits the cardiovascular system. Light drinking has no current definition but is presumably less than moderate drinking. Moderate drinking is defined as no more than 1 drink per day for women and no more than 2 drinks per day for men. Heavy drinking is more than 1 drink per day for women and more than 2 drinks per day for men. Binge drinking, which is clearly unhealthy, is more than 3 drinks for women and more than 4 drinks for men on a single occasion over 2 hours. At least a portion of the benefit of alcohol is due to decreased coronary artery disease deaths. Light to moderate drinking has many beneficial effects on the cardiovascular system and the proposed mechanisms include: increased high-density lipoprotein cholesterol (HDL), decreased plasma viscosity, increased fibrinolysis, decreased platelet aggregation, improved vascular endothelial lining function, decreased vascular inflammation, and beneficial antioxidant effects. These benefits translate to: decreased cardiovascular death, decreased nonfatal myocardial infarction, decreased development of heart failure (and no exacerbation of heart failure) in patients with underlying heart failure, decreased coronary heart disease, and decreased total mortality. Heavy drinking is associated with many harmful effects: increased mortality, high blood pressure, alcoholic cardiomyopathy, ventricular arrythmias, hemorrhagic stroke, cirrhosis, diabetes, cancer and unnatural and sudden death. There is one significant issue with regard to women and drinking that has not been resolved. Until recently, some research had shown that there was a 10% increase in breast cancer in women who had light to moderate intake of alcohol. However, middle-aged and older women with adequate folic acid (found in leafy greens, citrus fruits, beans and peas) in their diet and were not on hormone replacement therapy had the same incidence of breast cancer in light to moderate drinkers of wine as abstainers. One caveat is that breast cancer is not the number one killer of women as many people believe. Cardiovascular disease is the major cause of death in women and research has shown that there is a 50% reduction in cardiovascular disease in women who are light to moderate wine drinkers. A recent study by researchers at the Kaiser Permanente Division of Research in Oakland, California, led by noted authority on the health benefits of alcohol, Dr. Arthur Klatsky, confirmed a higher risk of breast cancer in women who were moderate drinkers . At the European Cancer Conference held in late September in Barcelona, Spain, Klatsky reported that women who drank one or two drinks a day increased their risk of breast cancer by 10%, compared to light drinkers (less than 1 drink a day). The risk increased to 30% in women who drank more than 3 drinks per day, whether the drink of choice was wine, beer or liquor. This 30% increased risk is comparable to the risk exposure of women who smoke a pack of cigarettes a day or take estrogenic hormones. Epidemiological research studies like Klatsky reported are often flawed by residual confounding (an unmeasurable factor). The group of women in this study were mostly affluent and well-educated women who drank a lot of white wine. It is known that it is polyphenols found in red wine that confer protection against cancer. The issues involved in the health benefits of alcohol are all very convoluted and complex. Until the defintive word comes out, do as I do, drink 2 glasses of Pinot Noir every day with dinner. And have your wife do as mine does, drink 1 glass of Pinot Noir every day with dinner. 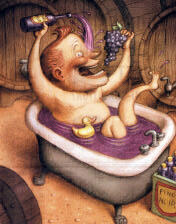 I should also add that I frequently bath in Pinot Noir but you may not want to try this at home. Circulation is available at www.circ.ahajournals.org. The two partners had the right idea and their labels on their upper tier wines offered a prose written by Estrin, each vintage offering a new chapter in an ongoing 1940s-era melodrama. The name Red Car was chosen as it evoked memories of the now defunct Los Angeles Red Car Trolley line. For Pinot Noir (they also produced Syrah from the start), they chose the name, Amour Fou, which is a French expression for a mad, obsessive love. The labels offered a tragic love affair that takes place in 1940s Los Angeles. The first release in 2002 featured a married man named Jack recollecting how his mad passion for another woman has lead him to a very dark place. The subsequent vintages carried on the novella. After Estrin’s passing, Carroll Kemp continued to lead a team to improve the quality and character of the Red Car wines in his honor. The initial winemaker was Tim Spear who left to concentrate on his Clos Mimi label. In 2004, Sashi Moorman (Stolpman) and Chris King (Lewis Cellars) came on board the Red Car as consulting and assistant winemaker respectively. The Amour Fou Pinot Noirs are blends. The initial partners, Carroll and Mark, were not “terroir-istes” at the start. They believed in making the best wines they could from more than one vineyard source. In 2004, Red Car Wine Company raised enough investment capital to buy 128 acres along the Sonoma Coast and vineyards developed here may change Red Car’s commitment to “single vineyard-istes.” Carroll says “we now prefer Pinot sites that are on the cool climatic edge. This allows us to obtain boldly ripe fruit that is still balanced with the zing of acidity. In California, this happens in Western Sonoma County or ‘West County’ in local-speak. Our new sites in the ‘true’ Sonoma Coast will give us another step forward when our ‘05s are released.” Their first vineyard-designate Pinot Noir, The Aphorist, was released with the 2005 vintage (see below). The style of winemaking has evolved over the six vintages to date. 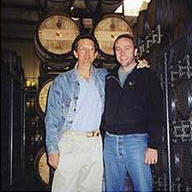 Mark and Carroll produced their first two barrels of Syrah essentially in Carroll’s Beverly Hill’s garage. The initial vintage of Pinot Noir in 2002 was made like their Syrah and was quite popular with the press and Parker who preferred big, extracted Pinot Noirs. The focus now has reversed and the Syrahs are made more like their Pinot Noirs. The latest Amour Fou still has vivid fruit but is crafted with more subtlety and complexity in mind. The Red Car Amour Fou Pinot Noirs released to date include the following. 2002: 70% Keefer Ranch Vineyard (Green Valley) and 30% Cloud’s Rest Vineyard (Sonoma Coast), 237 cases, $40. 2003: 70% Keefer Ranch Vineyard, 30% Sleeping Beauty Vineyard (George Martinelli owned, Russian River Valley), 275 cases, $45. 2004: 53% D. Giovanetti Vineyard (inaugural vintage, a Red Car Monopole, Green Valley), 47% Sleeping Beauty Vineyard, 400 cases, $50. 2005: 55% Bartolomei Vineyard (Sonoma Coast), 36% Sleeping Beauty Vineyard, 9% La Boheme Vineyard, aged in 73% new French oak, 273 cases, $55. A second bottling in 2005 was labeled The Aphorist. This was sourced 100% from Bartolomei Vineyard and aged in 100% new French oak, 48 cases. Red Car also produces a value-priced Pinot Noir and Rosé labeled Boxcar. 14.8% alc., 273 cases, $55. · This wine is royal in appearance with a deep violet robe. Intriguing aromatics of dark Pinot fruits, toast and cigar box. Heady black cherry and forest floor flavors are embraced by well-concealed tannins. Sleek and seductive in the mouth, this beauty ends with a long, chewy aftertaste that has a haunting cherry aroma. Very tasty. Red Car Wine Company wines are sold primarily through a mailing list at www.red-car-wine.com. There is limited restaurant and retail (mainly Los Angeles) distribution. The phone is 310-839-7300. 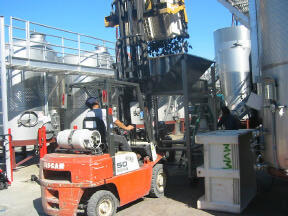 The wines are produced at Central Coast Wine Services in Santa Maria, CA. Offices are in Culver City, CA. The website is very impressive and the newsletter, The Almanac, is the best in the business. Alcohol content in wine, mainly ethyl alcohol, is expressed in percent by volume of the total liquid. Brix (symbol Bx) is the measurement of the ratio of dissolved sucrose sugar to water in a liquid such as grape juice and is expressed in percent or degrees. For example, 25° Bx solution is 25% with 25 grams of sucrose sugar and 75 grams of water in 100 grams of solution. Knowing the Brix of the grapes prior to fermentation, the potential alcohol of the finished wine can be determined if all of the sugar is fermented. A pre-fermentation Brix or sugar content of 22.5° of grape juice will produce a potential alcohol of 13.0%, 24.8° Brix will produce14.3 %, and 25,8° Brix will produce 15.1%. The Alcohol and Tobacco Tax and Trade Bureau (TTB) requires that the alcohol be stated on the front or back label of a bottle of wine (the exception is wines between 7% and 14% alcohol which may be labeled “table wine” or “light wine”). The tax rates for wine are determined first by whether the wine is over 14% (considered dessert wine) or under 14% (a table wine) and then by the tolerance (called “label leeway”) levels. Mislabeling of alcohol content is a serious federal offense. The tolerance range for under 14% wines is 1.5% (for example, a 12.5% wine may be labeled anywhere from 11% to 14%). The tolerance range for over 14% wines is 1% (a wine labeled 15% may have from 14.01 to 16% alcohol). It is not permissible for a tolerance level to cross tax classes - for example, a wine at or below 14% cannot be labeled as above 14%, and a wine above 14% cannot be labeled as less than 14.01%. This tolerance level allows many wineries to downplay their alcohol levels so be forewarned! Wonder why so many French and other European wines are labeled 12.5%? It is because wines with more alcohol than 14% are taxed 50% higher.